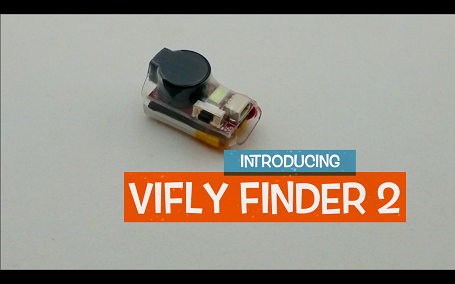 With ViSense-based technology, the VIFLY Finder 2 can power itself to beep even the quad battery has been ejected. Even more, the built-in light sensor can detect light intensity and then smartly control the LED light to flash. Besides, it enables the buzzer automatically enter into sleep mode at night to save power and not disturb. To easily find the lost drone in long distance, the VIFLY Finder 2 buzzer is designed to install a very loud beeper that the DB is over 100. Option 1, Disarm with button: Disconnect main battery, hold disarm button on VIFLY Finder 2 for 1-5 seconds then release.Option 2, Disarm with main battery: Disconnect main battery, then connect main battery for 3-6 seconds and disconnect it again. It will beep 3 times when disarmed successfully. VIFLY finder 2 is programmed to be compatible with any flight controllers to support FPV quad, and receivers for RC airplane. No extra setting required, it will automatically recognize the device to connect. Simply connects the VIFLY Finder 2 to your flight controller(racing drone) or receiver(RC airplane) via 3 wires, and it’s ready to enjoy your flight.